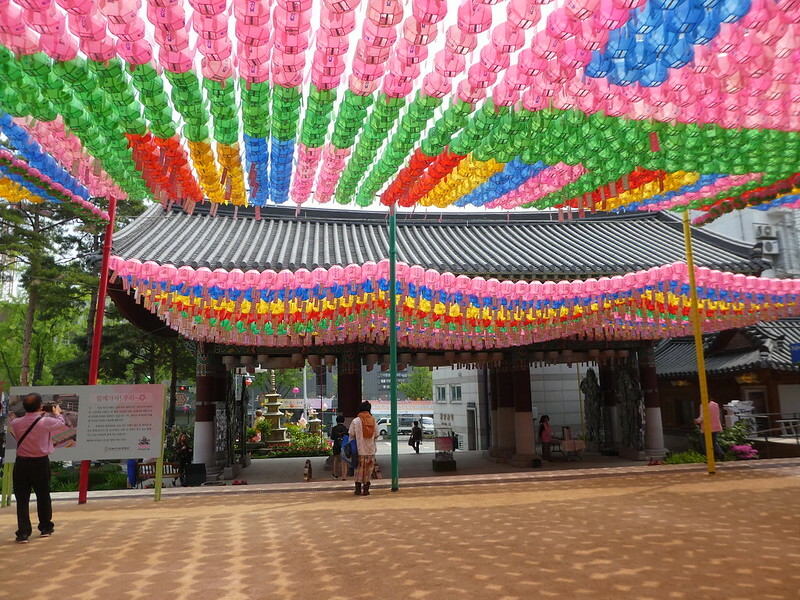 We set off on foot this morning to the Jongmyo Shrine which was located not too far from our hotel. Admission to the shrine is included in the palace combination ticket (10,000 Won / £6.98) which we had purchased earlier in the week. 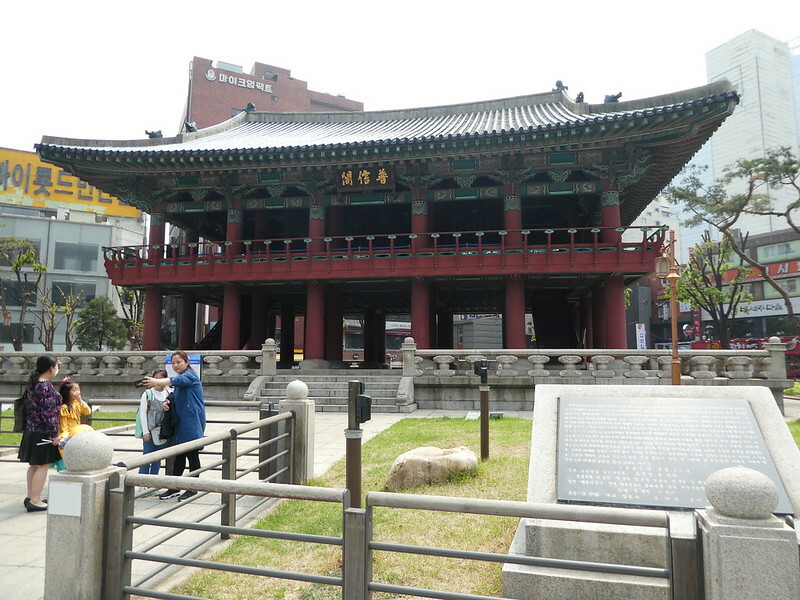 The shrine houses the spirit tablets of the Joseon Dynasty and was a primary place of worship for the kings. 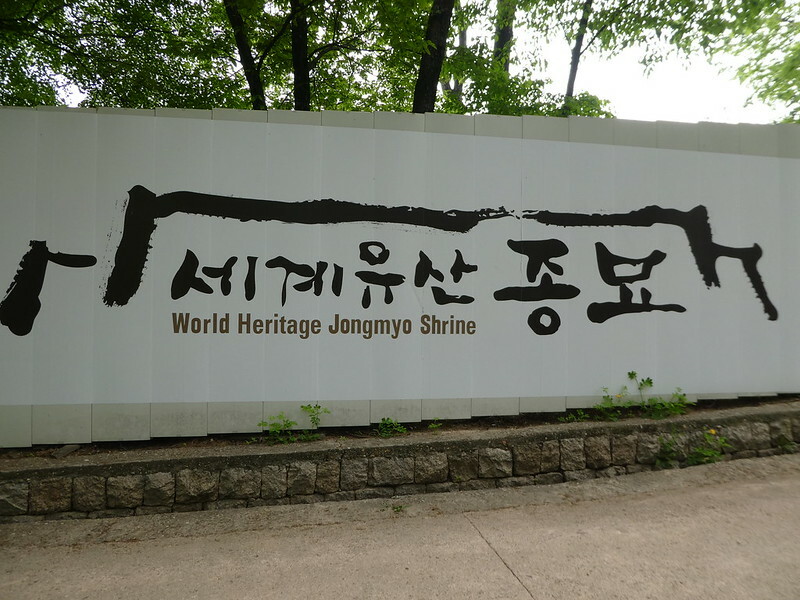 The Jongmyo Shrine was designated a UNESCO World Heritage Site in 1995 for its well preserved ancient customs. It was a pleasant stroll through the grounds but unlike the palaces we did not find very much to see. Next on our list was a visit to the nearby Wongaksa Pagoda in Tapgol Park. This ten storey marble pagoda was constructed in 1487 and stands 12 metres tall. 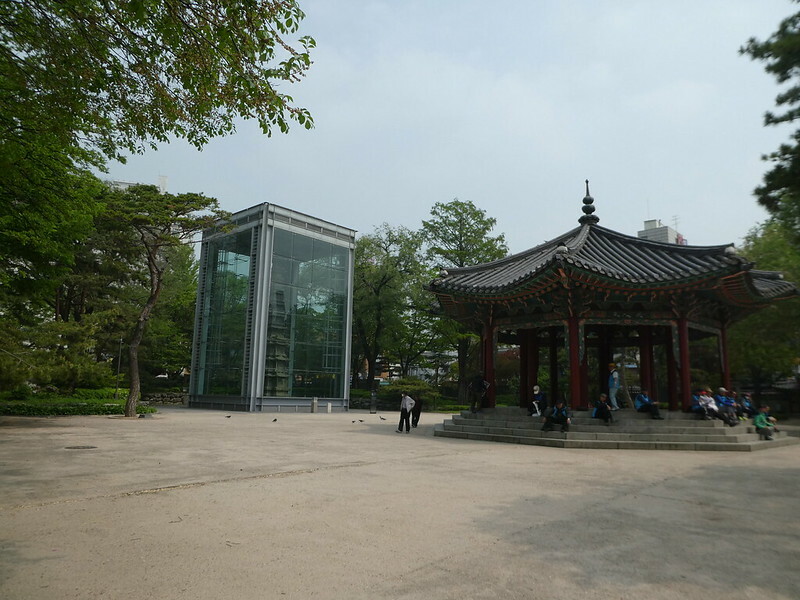 The pagoda is considered to be one of the finest examples of Joseon Dynasty pagoda art and is now encased in glass to preserve it which made it look somewhat strange. From there, our morning walk continued onto Insa-dong which looked quite different in daylight as we had only explored the area after dusk previously. We found its main thoroughfare Insadong-gil to be a little touristy with its many souvenir shops but they are arranged along a tree lined road so it was quite pleasant. On the way to the Jogyesa Temple we paused to take a look at the Bosinggak Belfry which was used to keep the time and signal the opening and closing of the city games. Walking a little further, we came to the Jogyesa Temple and just as we were entering the grounds we were offered refreshing cups of green tea which were very welcome. 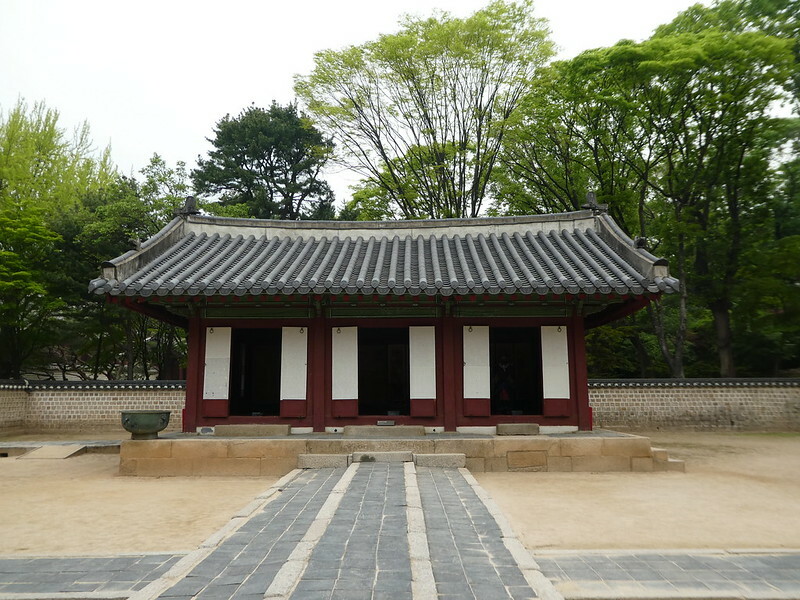 This temple was first built in the late 14th century and more recently was given the role as the head temple of Korea’s Buddhism. The Dharma Hall on its site serves as the main venue for several Buddhist events. The annual lantern festival in celebration of Buddha’s birthday was taking place during our visit making the temple look even more beautiful with its decorations. Leaving the temple we returned to our hotel via the Cheonggyecheon Stream and relaxed briefly with a coffee and KitKat before taking the metro from Euljiro 3 station just around the corner. Since arriving in Seoul we had seen posters advertising an international flower festival so we thought we would go and investigate. The festival was taking place in Goyang, approximately an hour by metro from the hotel but conveniently on the same line (Line 3) enabling us to enjoy a nice long rest. From Goyang’s metro station exit 2, we followed signposts to the flower festival which was only a 10 minute walk away in Ilson Lake Park. Admission on the day is 11,000 Won but 8,000 Won (£5.80) for advance reservations and foreigners. The event was first held in 1997 and since then the exhibition has attracted over 6.2 million visitors. 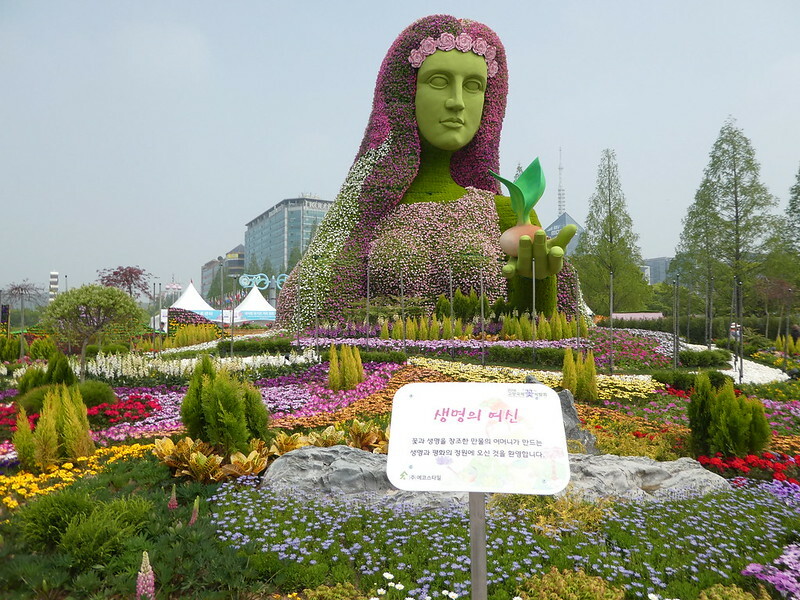 This year 320 organisations from 36 countries were showcasing flowers and related products making it one of the largest and most famous international flower festivals in Korea. It runs for 17 days and thousands of visitors come to the festival to admire its displays. As we passed through the entrance gates, the first exhibit to catch my eye was of the Moomins. 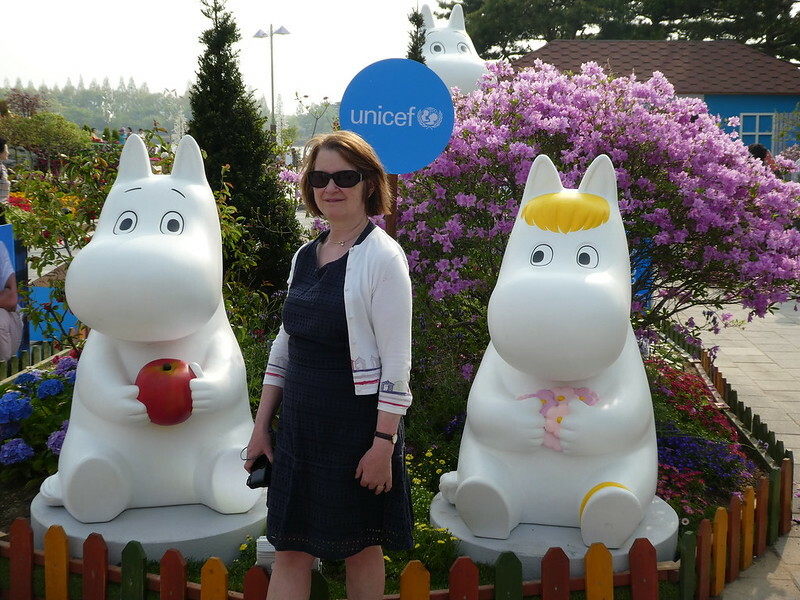 I adore the Moomin characters and earlier in the year had the pleasure of visiting the Moomin Museum in Tampere, Finland so I had to stop and have my photo taken with them! Studying our guide, we decided to start off with a visit to the world flower festival which consisted of a range of themed gardens from different countries. The displays were all really nice containing flowers specific to the nation, arranged in unique designs such as the iconic Taj Mahal for the Indian display and Marina Bay for Singapore. We had planned our visit for a Monday afternoon as we thought it would be quieter than at the weekend which was probably the case and although there were lots of people looking around it never felt too crowded. Next, we passed a stand offering visitors an opportunity to dress and have photos taken in traditional Hanbok costumes so I thought it would be nice to do this as it was free of charge. An assistant offered a choice of costumes to try and then helped to dress me. The costume fitted neatly over the top of my own clothes and because I am quite small. was just the right length. I did notice some other ladies who were taller than me looking a bit strange with their trainers sticking out below their costumes! Having removed the beautiful Hanbok costume, we continued our tour around the exhibition marvelling at the unique displays which were full of detail and dazzling with spring colour. 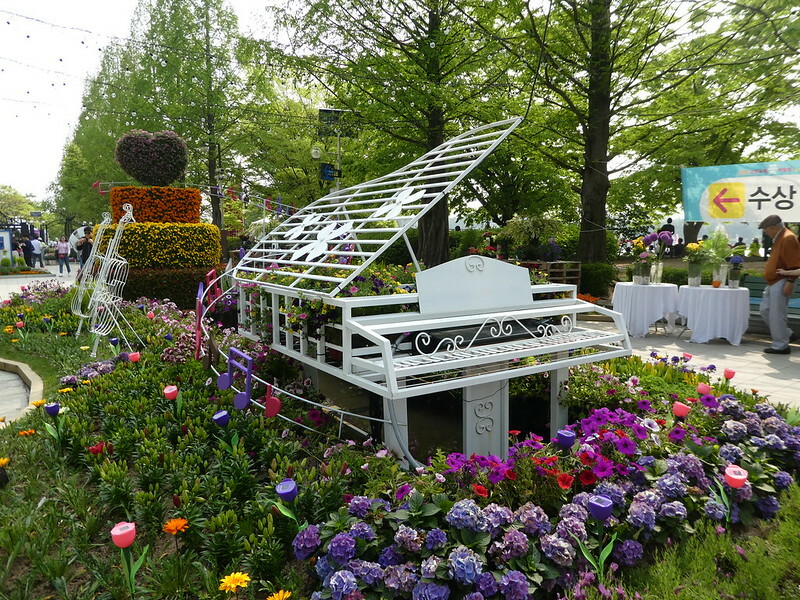 I loved this grand piano centred display with flowers cascading from its piano lid trellis. The event covers a large area with so much to see. There were a couple of live stages where musical and cultural performances were taking place at various times throughout the day. For the flower enthusiasts there were also floral art demonstrations, planting workshops and related competitions. The large indoor exhibition halls featured orchids, roses and other exotic flowers from nurseries around the world. The nearest to home that we found was a stand showcasing clematis from Guernsey in the Channel Islands. Before leaving the exhibition we strolled through the Tulip garden which was ablaze with colour and reminded me of my visit to the Keukenhof Gardens in the Netherlands the previous year. After leaving the exhibition we glanced in some of the shops in Goyang and sat on a bench to eat ice cream cones. Our hour long metro ride back to the hotel passed speedily as we both fell asleep, timing it well to wake up just before our Euljiro 3 stop. Later, we again dined at a Korean barbecue restaurant reflecting on the lovely day we had enjoyed. So pleased to read you enjoyed it! Excellent images and information. The flowers are amazing. Thank you for your much appreciated thoughts. I thought the flowers were stunning as well! Many years ago, back in Iwakuni Japan, (spring 1968), I enjoyed that city’s flower festival. You brought back some great memories. I thank you for the journey. I’m so pleased to read that this post brought back some fond memories of a Japanese flower show for you. Your nice comments are much appreciated. Thank you Richard for your kind words. It’s good to read you enjoyed this post. It’s my pleasure Jaylani, thank you for your much appreciated comments. I was in seventh heaven going all that way and seeng the Moomins! I love flower festivals Marion and this one looks spectacular…loving the photo of you in traditional costume – gorgeous. Thank you for your kind words Sue. The Asian flower festivals we’ve been to both in Korea and Hing Kong have been much more imaginative and fun than the ones I’ve experienced nearer home, and I just loved being dressed in that Hanbok costume, pity I couldn’t keep it on! M.
Fantastic trip. You have seen so much . That is great and I love your photos. Thank you for your kind words, it’s so nice to read that you are enjoying my series of posts on Korea. I think you must, South Korea s absolutely beautiful. Thank you for your much appreciated thoughts. Thank you Linda, they were absolutely beautiful. The pictures are all very resplendent laced with the vivid colors of scenery. But the gem of the pix has to be the lovely portrait of you in a Korean traditional costume. It’s a pleasure reading your travelog. Thank you. Thank you so much Stephanie for your kind words and it’s so nice to read you are enjoying reading about my travels. 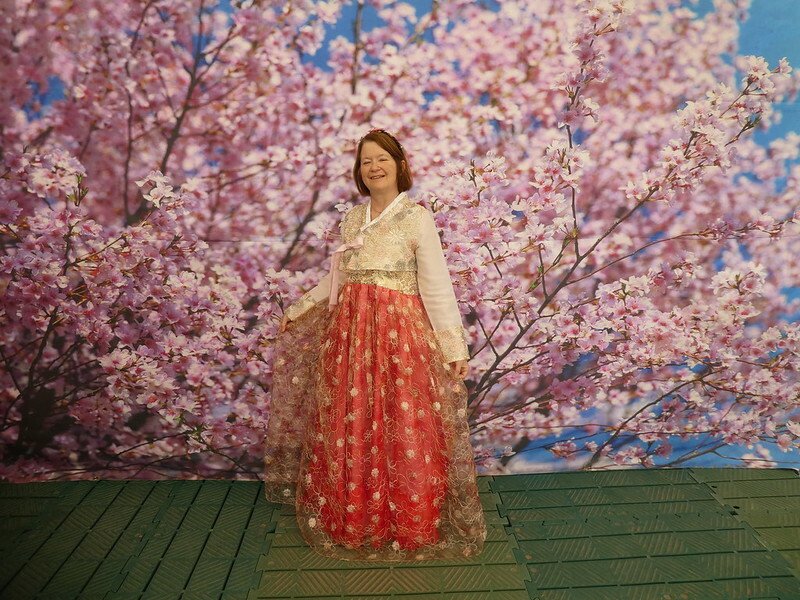 I loved wearing the Hanbok costume and being able to have a photo souvenir of me wearing it. Wow absolutely beautiful. Thank so much for sharing it with us. Thank you for your kind words. It’s so nice to read that you have enjoyed this post Kai. The botanical exhibition looks really nice! And that traditional Hanbok is beautiful and looks great on you! Thank you for your kind words. Both the botanical exhibition and wearing the Hanbok costume were such nice things to happen that day. 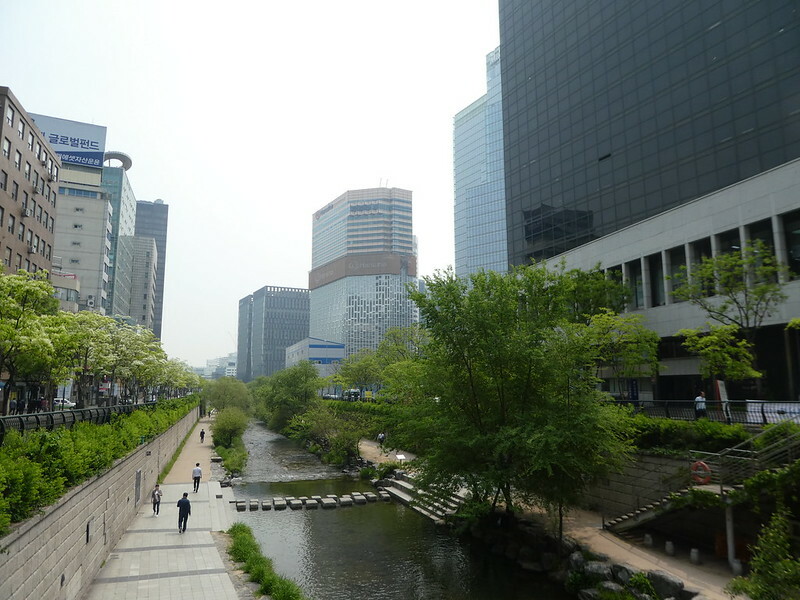 These are lovely areas of Seoul that we did not visit, save Insa-dong. The Flower Show looks like a classic event of great beauty. Perhaps you can visit some of these places if and when you make a return trip to Korea. We were so lucky to time our visit to coincide with the flower festival as it was so beautiful. You chose the right time of the year for the flower festival. During winter time with all the snow and ice around Korea is still majestic but cold and minus some of the bright look you’ve captured on your journey. 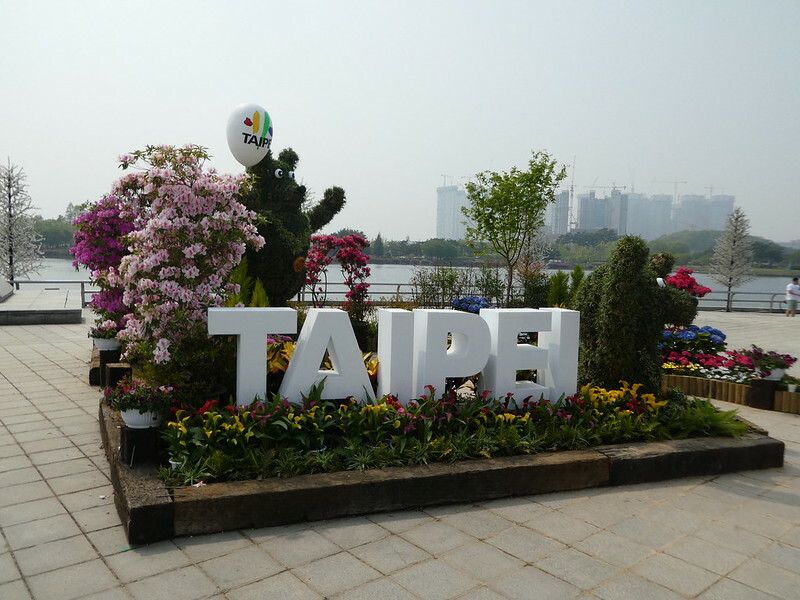 We were very fortunate Ian to time our visit to concede with the flower festival and apart from the first couple of days and another rainy day at the end of the trip we had splendid weather at just the right temperature for getting around. Loved the costume and flower exhibit photos. Thanks for sharing! Thank you for your kind words. It was lovely to have the opportunity to dress up in the Hanbok costume and to have timed our visit to Seoul to coincide with the flower festival. Thank you so much for taking the time to read my blog posts and for your kind words. I hope my posts on Korea might inspire you to visit there one day. Thank you Allan. We had absolutely no idea of the flower festival’s existence before arriving in Seoul so we were so lucky to have timed our visit to perfection. That’s so true Allan and that’s why we are always flexible with our planning. Flower festival looks amazing and I love the temple. Also can’t quite believe how clean everywhere is, not a scrap of litter. How good is that? 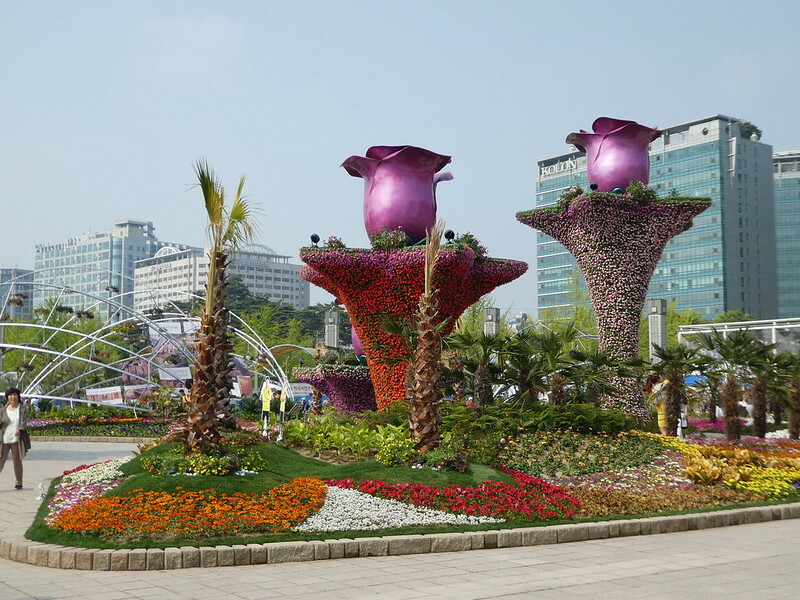 We couldn’t have timed it better to be in Seoul to coincide with the flower festival. The imaginative displays were stunning and it was lovely to see people of all ages enchanted by their themes. I d do believe Korea to be one of the cleanest places I’ve ever visited Jonno. There was no litter or graffiti anywhere to be seen and every flowerbed whether it was a the roadside or in a park was beautifully maintained. It was so nice to see how much pride is taken with everything. So many other countries could learn from their example couldn’t they? Thank you for taking an interest in this post Jo. 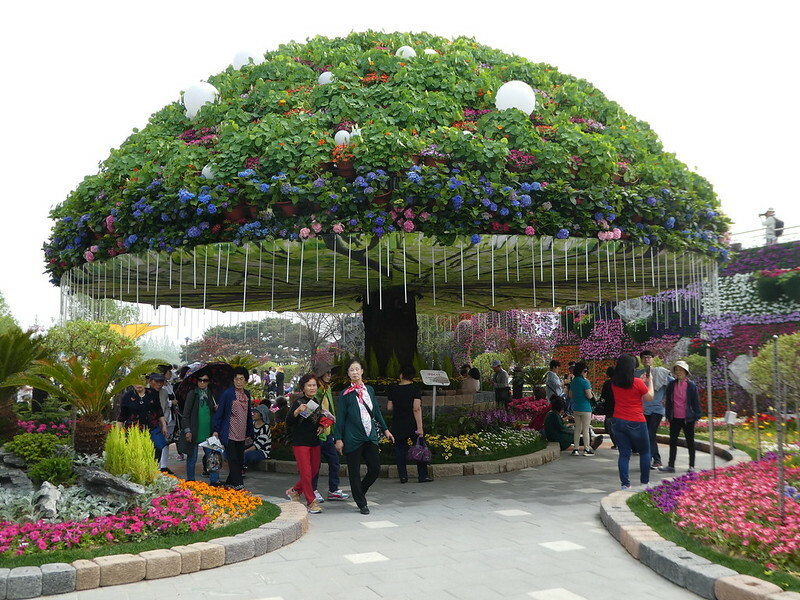 The flower festival was absolutely beautiful and similar to the one we had visited last year in Hong Kong. 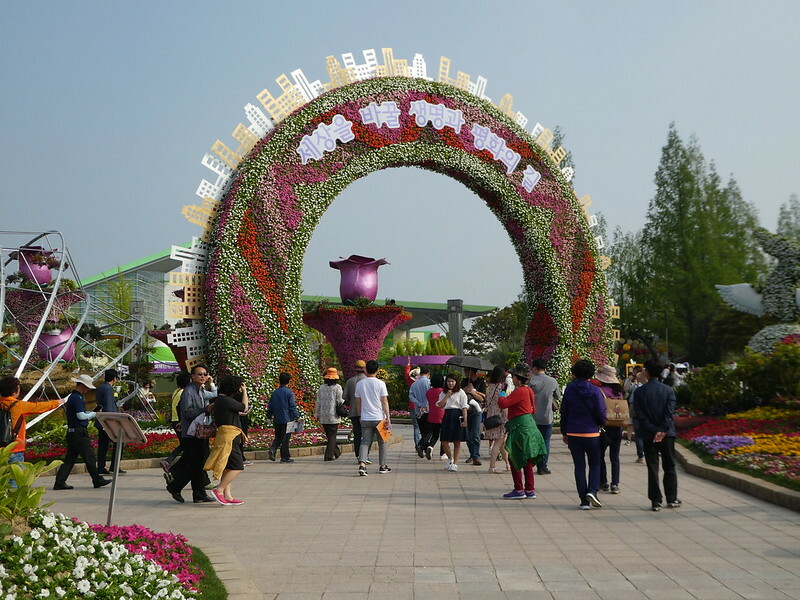 The flowers are exhibited in such unique, interesting ways making them so appealing to visitors of all ages. 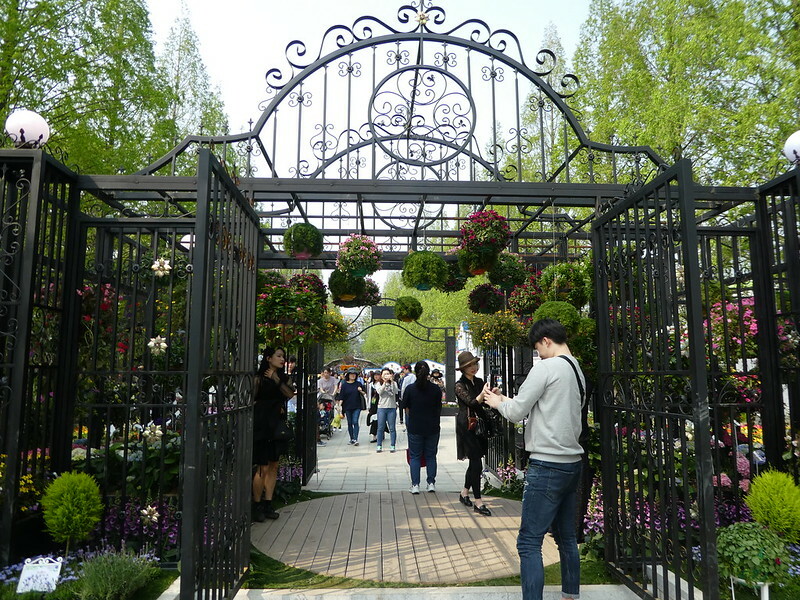 The event is huge and entrance is a fraction of the cost of U.K. flower shows so it was fortunate we timed our visit to coincide with the festival. Thank you Ramona, it was such a lovely day out and I enjoyed wearing the traditional Hanbok costume. Your traditional Hanbok outfit is beautiful! Thanks Angie, it was so nice being able to try the Hanbok costume on and be able to have my photo taken wearing it. The Moomins must have been a bit unexpected and out of context! And what a fabulous flower festival. Was Korea a “bucket list” destination for you? It’s certainly proving a fascinating destination, and I’m really enjoying your posts. Thank you Stella for your continued support of my blog. Last year we visited Taiwan which was equally beautiful so we researched Korea and just decided to go there as it seemed so nice with lots to interest us. It’s much cheaper than neighbouring Japan although I would still like to visit there one day as well! 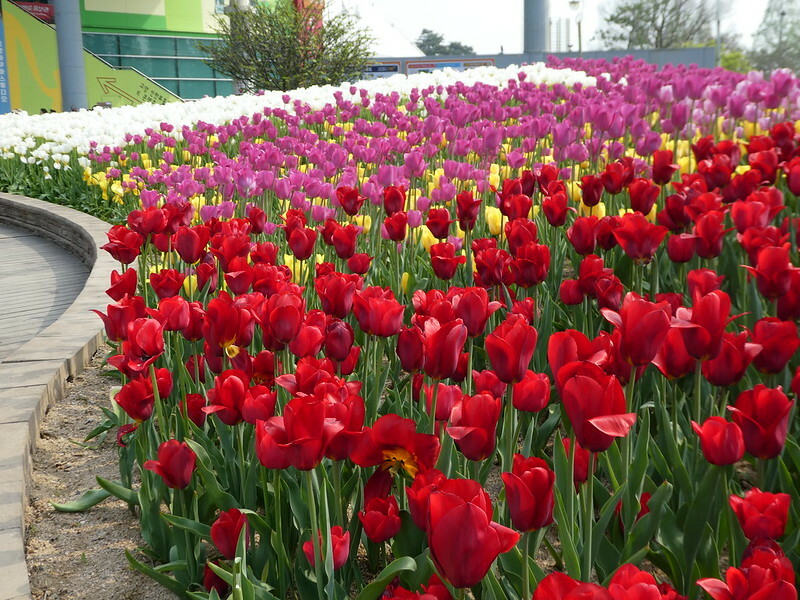 The International Horticulture Goyang look stunning. I hope to visit it someday too. Looks like a great trip so far. Thank you, the botanical exhibition was amazing and we hadn’t heard about it until our arrival in Seoul. I do hope you get an opportunity to experience it for yourself one year. Thank you for your kind words. Visiting the botanical exhibition was amazing and I’ll never forget the experience of trying on the Hanbok costume. Wow LMT. I have to say Korea has been off our radar but now it’s high on our list. That’s so nice to read! Korea is beautiful and by sharing my own experiences I hope I will be able to inspire more people to visit. Thank you. It’s good to read that you enjoy my posts. The botanical exhibition is amazing! It reminds me a lot of the one in Ottawa, Canada. The botanical exhibition was indeed absolutely amazing. I have only seen one like it in Hong Kong. Thank you Ruth and Vijay for taking the time to comment. It’s much appreciated.